Michael Shainblum is a photographer and time-lapse creator based in San Francisco. Venturing out into the landscape of the California Coast, he captures stunning views of the Milky Way under the vast desert sky, the brilliant rush of ocean seascapes, and natural elements unleashed. We spoke to him about how he began practicing photography and what inspires him to create this vivid imagery. Moving Art spotlights artists that push the limits of modern image making techniques to produce stunning, ultra high-definition images. We partner with leading companies like 500px to bring greater awareness to these creators, while highlighting work well suited to being experienced on Depict Frame, a dedicated display for 4K digital and moving art. This Artist Spotlight was originally published on Moving Art, and is being republished here with express permission. I’ve always been interested in art — everyone has their thing, and art was mine. From the time that I could hold a pencil or a crayon, I would doodle and draw, I sculpted and I painted. I did everything and I wanted to explore any craft within art. Then I learned how to develop film in the darkroom, and eventually got into film photography. I was never good at sports, never good at academics. I’m dyslexic, have short term memory, and learning disabilities made school challenging. I tried it all with organized sports, soccer, basketball, and I didn’t enjoy it — I didn’t like the competitive nature of it. So how I discovered who I was and how I found myself was through art. The way I got into photography was a little indirect. I was originally very invested in graphic design and digital art, so I would use stock photography as reference or to composite into whatever I was painting or designing. Then I started taking my own photos for use in digital art, and I learned that I enjoyed the photography side of the creative process — not necessarily more — but just as much as the post-production side of digital art. So I started taking photos every single day, and eventually photography became all I did. Then I became interested in creating short videos, but at that point I couldn’t afford a video camera. So without this video functionality, I realized what I could do was take a series of photos. I would just click the shutter over and over, see the clouds moving, click the shutter over and over, see cars moving, then click the shutter over and over. And then I would take all of these images and create little stop motion films, essentially building time-lapse by taking a series of photos and creating a film out of it. And that was how I bridged the gap between photography and video production into time-lapse. Before I graduated, the last year I was in college, I started seriously working on my first film, Existence. The concept was to show the juxtaposition between rapid city life and the gradual motion of nature, bridging the gap between the two. When you go outside in a city at night and look up at the stars, it appears that everything is still. Nothing seems in motion. But when viewing the night sky through time-lapse, you realize that the world is always moving, even in places that seem incredibly still. Time-lapse and photography — they tell two different types of stories. That’s the thing with time-lapse, you have to almost predict what’s going to happen and analyze the motion throughout the scene. I’m looking at the motion over time: how are the clouds going to move throughout the scene? will I pan or use my dolly to move across the scene? how will a scene look not just in the first frame in the present moment, but how it will look ten minutes from now, or as the camera moves along the tracks? It’s a lot more about predicting what’s going to happen and capturing it within a scene. But time-lapse and photography are each really difficult crafts in their own ways. With photography, I’m focusing on getting that single moment perfect. It’s more of an immediate thought rather than what is going to happen. Whereas with time-lapse, you have to think about how you’re going to create a film that tells a story and takes people through a journey. In the post production, you’re combining different elements and music, and it’s just very different from telling a story through a photograph. They tell two different types of stories. You have to go out there with a certain frame of mind about what you’re going to capture. Some people say when you shoot a photograph you’re showing a second of time. But for me it’s not like that at all when I show a photograph; I’m not trying to show one second of life. I’m trying to show an experience and the emotion of a place. 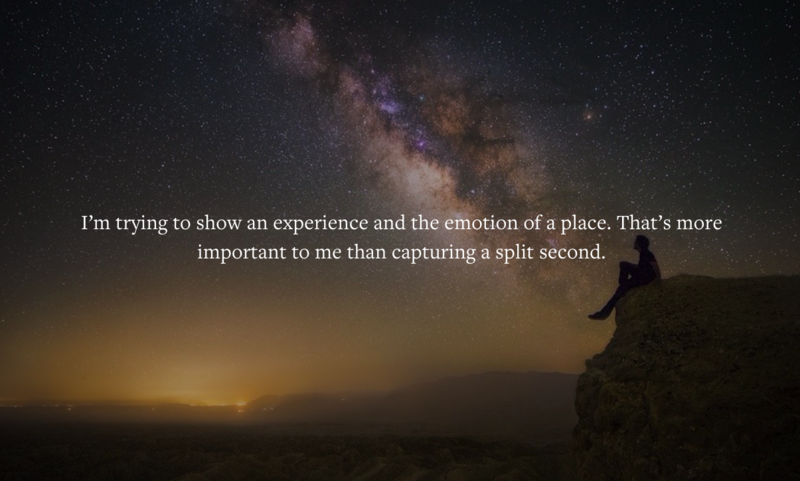 That’s more important to me than capturing a split second. Time-lapse is about predicting what you want to shoot, but it’s challenging to focus on both photography and time-lapse. That was something that was hard to understand at first, I would try to do photography and time-lapse all on the same shoot. But you have to go out there with a certain frame of mind about what you’re going to capture. The creative process of both photography and time-lapse are fairly different, but I find photography more personal. It’s a little more free, while at the same time a little more challenging to take a photograph; you’re considering the foreground, how to frame the elements in a certain composition. Everything has to be perfect in that one frame, and there’s a certain challenge in that. And when processing the images, I take my tablet and dodge and burn, similarly to what one would do in the dark room, and I use my hand to expressively paint. In that way, I feel like I get a little bit more creativity out of photography. Whereas with a time-lapse, it’s very technical. You can definitely get creative with time-lapse, but there’s a lot of technical elements. I upload the images into Lightroom, then I batch process all the images, and then I use After Effects to create the time-lapse, and then I go into Premiere for final edits and adding the music to the file… it’s a lot more methodical and I don’t have that same expressiveness as when I’m using my tablet and painting on the image. That’s why photography feels a little more personal to me. I love painting and I love drawing, and photography allows for a little more of that. “Into the Atmosphere” was one of my more recent nature films, which was featured by National Geographic. I wanted to create a short film showcasing California’s beautiful landscape. But instead of just showing the typical places, like Yosemite orDeath Valley, I wanted to show a broader range of landscapes: the Santa Monica Mountains, the Anza-Borrego Desert, San Francisco’s seascapes, La Jolla and other less seen areas of San Diego — all these places. I wanted to show that finding nature is not just about getting as far away from the city as possible and retreating to these national parks, it’s everywhere. The most intense, incredible scene is the enormous storm cloud in the middle and end of the film. That was one of the most vivid storm clouds I’ve ever seen, and it was in San Diego where I had never seen anything like that before. Usually, I’m set up ahead of time and I’m waiting patiently for light to change, but on this specific night, that cloud just appeared out of nowhere and we were driving so fast to try and catch it. We were just watching this beautiful cloud lighting up with color — it looked like a bomb went off and there was just this explosion. And then as soon as the light all died came a lightning storm, towards the end of the film. It just started raining down lightning every single second. It was this super cellular cloud that came in from a storm in Baja, they come in out east and end up over the desert, in the Anza-Borrego Desert. We just happened to catch it on this specific night, and it was incredible to watch. There’s this other particular shot where the Milky Way is rising, and the moon just comes up and hits this old tree. That shot is important to me because that’s the Ancient Bristlecone Pine Forest in the White Mountains of California, and some of those trees are the oldest living trees in the world. And that was one of my first times out in that area, spending the night out there with a few of my time-lapse friends, and I was just sitting out there, staring out at the night sky and just being so in shock of how beautiful it was. Then you see these beautiful silhouettes of these old gnarled trees, and as soon as the moon struck them all you see all of the vivid shadows and details, and that was quite an incredible experience for me. So I do go out and create these works for myself and my own happiness, but it’s inspiring to hear that people get motivated to go out and shoot, go out and explore, or just get off their computer and stop watching the film and actually experience something. That’s something that is very important to me.